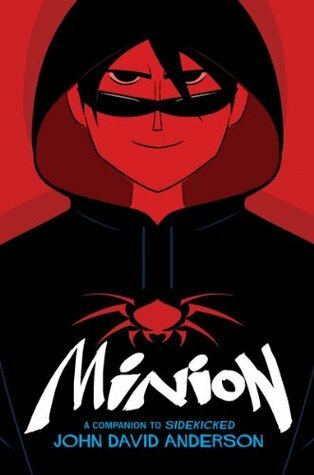 Ms. Yingling Reads: MMGM- Minion Blog Tour! Visit the Blog Tour Sites! It's a good way to meet some new bloggers and to get some more information about this fantastic story! E ARC from Edelweiss Above the Treeline. Michael was abandoned at a White Castle as a baby and raised in an orphanage near New Liberty, and is eventually adopted by his dad, who is a "mad scientist" who lives off the grid and events gadgets for evil doers. He takes very good care of Michael even though their home is a bit thread bare. Michael is friends with Zach Romano, another orphan adopted by Tony, who has New Liberty under his thumb in a Mafia-like way. The two like to hang out at the local mall and gawk awkwardly at girls, and this is how Michael meets Viola. Here's the catch-- Michael has the ability to make people do his bidding. And Zach can make spikes poke out of his flesh. So far, Mike's used his power mainly to bilk people at ATMs out of small amounts of cash so he and his dad can afford food, but he's tempted to use it to have some female company. Or, more likely, to help his dad out when The Comet, a new superhero, arrives in New Liberty and starts messing with the carefully constructed support network that Michael and his father have set up. When The Dictator, an evil villain, also arrives and puts Michael's dad in peril, Michael knows that he will have to use his powers. Strengths: This was awesome! I have a lot of students asking for super hero/villain books, and the brilliant part about Anderson's writing is that he drops you right into the well-constructed world of New Liberty without apology AND he totally gets middle school boys. The friendship between Michael and Zach is wonderfully warm, but in a hit-you-on-the-shoulder-instead-of-hug-you way, and Michael's appreciation of Viola is pitch perfect. I really liked the depiction of his father, which shows that you don't have to be perfect to be a parent, you just have to be present and concerned. The cover also gets the perfect middle school balance between goofy and serious. I'd sort of like to know more about Michael, but the fact that Anderson's books are also (somewhat related) stand alones-- just right. Weaknesses: I completely forgot how this ties in with the first book, but I'm sure my students could remind me! Love the premise. SIDEKICKED is hopelessly buried on my TBR list so maybe its time to move both these titles to the top. A super hero story sounds like a perfect summertime read. Thanks for featuring and have a great 4th. Great review. This seems a really good book. I haven't read the first (which didn't appeal to me), do you have read it to read this new one? Oh! Sidekicked is on my Kindle now. It was a deal of the day last week. Note to self: must read. Looks like too much fun. So it sounds as if it won't matter that I haven't read Sidekicked? This sounds like a lot of fun. I don't think reading Sidekicked first is necessary. This was the same "world", but different characters, and much darker than the other book. I loved Sidekicked, so I'm eager to read this one. Sounds wonderful - I'll have to get both books now! Looks great. Thanks for the heads up. Love the cover and title. My daughters would enjoy reading Sidetracked and Minion. Thanks for sharing! I've always enjoyed the premise and cover, I must locate this one. Happy fourth! I had missed Sidekicked somehow - so thanks for letting me know about these books!